A week does seem like a lifetime in the blogging world but you must forgive me as I have been a little poorly!As you all know by lovely boyfriend is very good at surprising me and taking me to these wonderful places. Normally it's a monthly surprise but lucky me got treated TWICE this month to another spectacular place. I must apologise for those who do not like the lengthy blogs - I can feel this one being a long one! Galvin At Windows was never on my list of places to visit until I watched the television series 'First Dates' where I found out the 'host' is this amazing French guy (also very very dishy) works at Galvin At Windows. When doing my homework on the place I figured that this is a place I would HAVE to visit in the foreseeable future as it was a Michelin star restaurant with amazing views. So my little love, found an amazing deal on bookatable and voila! Here's where our story begins. Situated in the Hilton Park Lane Hotel you take an elevator up to the 28th floor and are greeted by art deco interiors. When you enter the restaurant there is a 'stage' platform where there is higher seating and then there are the window seats. As you can imagine everyone wants to sit by the windows so there was no room for us but nevertheless we had a lovely table on the platform however we were re-assured that when a window table became available we could have it. We sat down and within minutes a large glass of raspberry bellini was in my hands. The lunch menu from bookatable was £30 for three courses + cocktail. The menu looked incredible and I had never eaten in a Michelin starred restaurant so was expecting great things. For starters Andrea and I both ordered the Bouillabaisse, saffron potatoes, fennel & aioli, however when the dish came to the table it wasn't that at all. The waiter apologised profusely and said that we could have both starters and this one would be on the house. Not that I was complaining as I got to try both starters and experience more delicious food. So the other starter we had was the Chilled pea soup, sheep's curd, jersey royal and mint salad. After devouring both (greedy I know, but necessary) I think I actually preferred the pea soup. It was so refreshing and full of so much flavour. It had a little crispy piece of bread on the top which gave it so much dimension and added texture as the curd was thick and creamy. 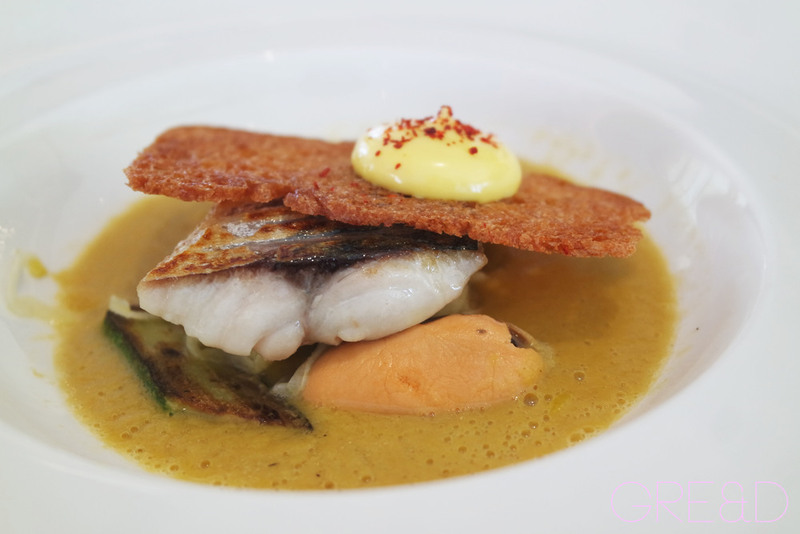 The Bouillabaisse was lovely though, tasting like the sea, a large mussel and a small piece of cod again with a thin crisp added texture and a bit of earthy-ness to the dish. 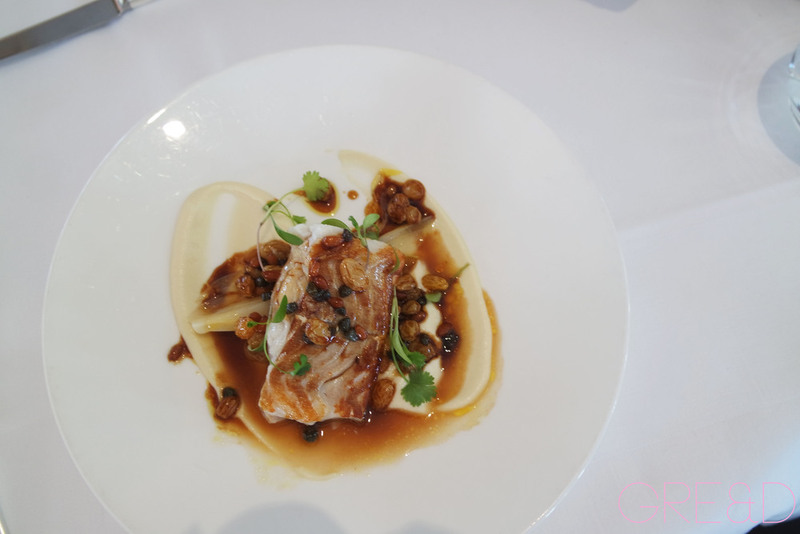 For mains, I decided to keep in with the seafood theme, and ordered the Pan-fried fillet of cod, cauliflower puree, braised endive, pine nuts and curry oil. It was like eating a dish out of the middle east. It was so sweet, yet it met with the salty flavours from the cod but it wasn't overpowering. There were raisins which were placed like little gems around the main showcase. It felt like I was eating a dessert, purely on the flavours but it was nice to have a sweet main. Andrea chose the risotto of wild garlic, peas, broad beans and percorino. This was also delicious. The percorino added that mellowness to the garlic. Unlike most risottos, it wasn't too heavy so was a real winner. By the time we ordered pudding we luckily got a chance to sit in the window which was the cherry on top to our lunch. We couldn't believe the views. It was so lovely to see London in bloom. Puddings. Now there were 2 desserts and a cheese board option, so opted for both desserts. Valrhona choclate fondant, nougat parfait & orange ice cream. Along with Almond creme brulee, strawberry, anise & cardamom ice cream. 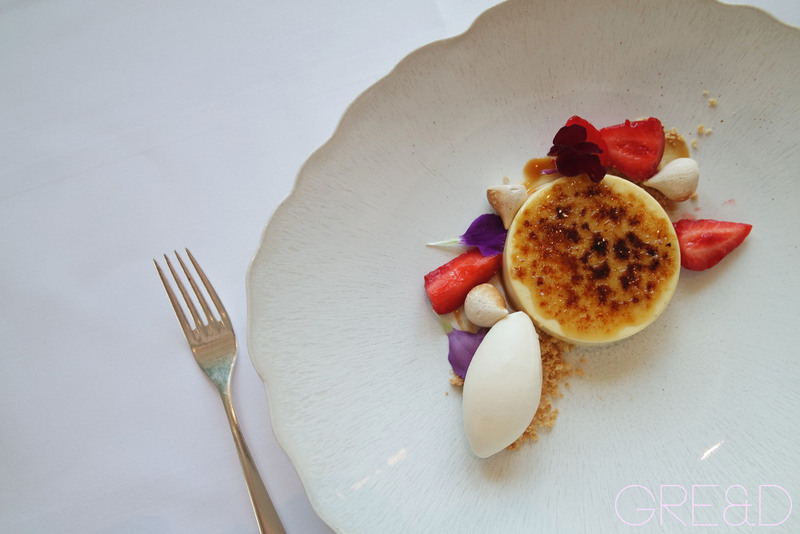 Personally I am not a fan of creme brulee but I can appriacte how they are cooked and how they come out. it's got to have a good sugar topping so that when you hit your spoon on it, it cracks. I was more interested in the anise & cardamom ice cream as I use those flavours a lot in my own cooking. It was amazing. You get those warm notes through chilling ice cream. Great juxtaposition. My chocolate fondant was perfectly cooked, nice and gooey in the middle. But the winner on my place was the orange ice cream. It also came with a chocolate crumb so when putting it in your mouth was like eating a Terry's Chocolate Orange. It was so fragrant, I have never tasted anything like it. When we thought it was all said and done, with bellies the size of houses, a long plate with 4 chocolates came! It was rude not too. 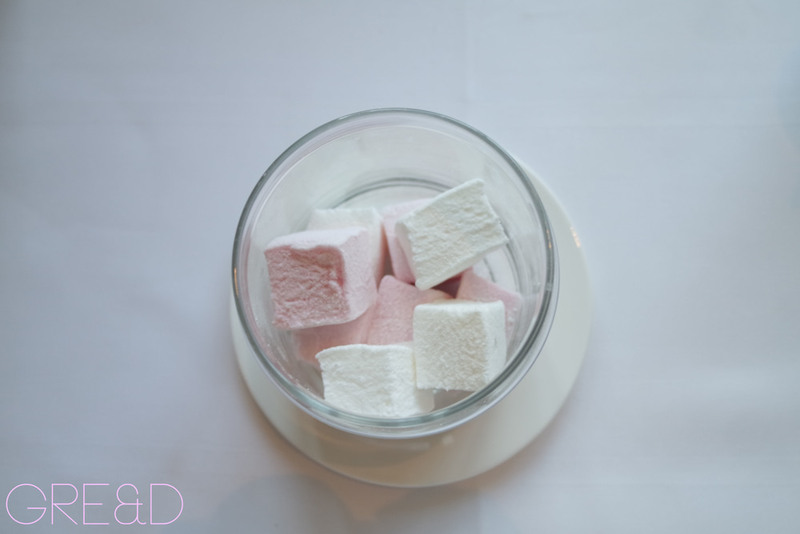 Then when our bill arrived, a jar of homemade marshmallows came! The waiter apologised for giving us more goodies to eat, I was so full but I had to taste one of each. He explained that they get made twice a day on site and take hours to make. The white one was coconut and the pink strawberry. They were the biggest, fluffiest marshmallows I have ever eaten in my life. So really, we actually got 5 courses if you include the chocolate and the extra marshmallows, all for a lovely price of £30pp. Oh also - when we sat down at our table, a waitress presented us with three postcards all with different views from the restaurant. She informed us that we can write on them and they send them free of charge. I thought this was such a great idea. For people who have loved ones who don't live in London it's a great way to share your experience rather than posting it on Facebook or Twitter. It gives the restaurant an air of romanticism, with old fashioned post card writing. I wrote one to my grandparents, so hopefully they will receive it in the post next week! Lunch on the 28th Floor?